NEWS – A three week break preceded MSOKC Race No. 3, which was held on a Saturday to avoid the middle of the Memorial Day weekend. Life at the Bruce household has been hectic with end-of-school-year activities, so not much preparation occurred between races. Henry got new front tires, but that was about it. I had not even unloaded the trailer before installing Henry’s tires on Thursday. Earlier in the week, we received news that Henry had been accepted for admission at Brown University in Providence, Rhode Island. Admission to Brown, which is a member of the Ivy League, is extremely competitive, so we were are extremely proud of Henry for this outstanding academic achievement. Orientation begins August 30 and classes start September 3. PRACTICE – We managed to arrive at a reasonable time on Saturday, so practice started out routinely. Henry decided to use his practice rear tires while breaking in his new fronts. When we went to bolt his primary rears back on, we discovered a big chunk missing from one of his magnesium rims – a product of contact from his feature race incident in Race No. 2. Laura, who had not left home yet, agreed to bring a spare from the garage, but would not arrive in time to make the change prior to the start of Henry’s first heat. Henry seemed to like the balance with the old/new combination, and decided he would try to run the whole day like that, preserving his primary rears. Conor reported that a slight vibration that he originally reported after his feature in Race No. 2 was still persisting. Upon closer examination, we discovered that his rear axle was slightly bent. We rotated the rear wheel on the bent side to minimize the eccentricity and decide that this would get us through the day. Fortunately, Peter’s practice sessions were trouble free. BRIGGS JUNIOR –Peter was the only one in his class again, but we did meet a dad and a son on Saturday who plan to join this class soon. Peter’s class was again combined with the class that he ran last year, which included the national points-leader in this class. They were visiting from Virginia in preparation for a WKA Hortsman Gold Cup national championship race at Circleville Raceway Park later this year. Peter took the lead and led every lap of the heat races and the feature in this combined class, but the national level guy was not far behind. We were happy that he had Peter as someone to keep in his sights. 80cc SHIFTER – Henry started his first heat race from outside the front row (second of nine). I had a feeling that he could win this heat race since some of the faster karts were starting from the rear. At the green flag, Henry began to roll immediately and appeared to be headed for the lead in the short run to Turn 1. That’s when it all went wrong. He lost all momentum and raised his hand as all the other karts when flying past. He came to a stop between Turns 1 and 2 and hopped out to survey the situation. The culprit ended up being a broken throttle cable. He hopped back in and puttered back to the pits while operating the throttle with his hand. The design of the throttle cable attachment point on this kart is not ideal, and we’ve had to fix a frayed cable several times over the past few years, but we had not checked it recently. A ninth place finish was the result. Henry made another great start in his second heat, promoting himself from seventh to sixth position. While pressuring the kart in front of him, he lost the position again on Lap 2. He was able to make up two more positions on Lap 4 and finished fifth. A ninth and a fifth resulted in a seventh place starting position for the feature. There was a lot of bumping and banging going on in front of Henry on Lap 1. As a result, he found himself up to fourth at the beginning of Lap 2. Henry and the kart in front of him were being held up by a kart that I knew would be disqualified at the end of the day for using non-club spec tires. The kart in front of Henry was able to get by on Lap 4. I was content to see Henry follow this other kart to the finish, but he apparently did not know about the tire issue. He pushed hard to the finish and was eventually promoted to third, which is not a bad way to end a day that started out poorly. NEXT RACE – While Peter’s day was uneventful, Henry (no go) and Conor (no stop) had problems that were quite the opposite of each other. Both rebounded for respectable finishes, however. Conor will get a new axle for Race No. 4, which is the first night race of the season on Saturday, June 7, and Henry will get his throttle cable reconfigured. Hopefully, there will be at least two karts in Peter’s class. We also know now that Henry will miss the last three races of the season, which is a small price to pay for such an excellent education opportunity. We received news earlier this week that Henry was accepted for admission at Brown University. Brown, which is a member of the Ivy League, is a private university located in Providence, Rhode Island. It was founded in 1764 and is the seventh-oldest institution of higher education in the United States. US News & World Report has ranked Brown second in the country in excellence in undergraduate teaching. Admission to Brown is extremely competitive, with an overall admissions rate of 13.3% for the class of 2012. Congratulations to Henry for an outstanding academic achievement! NEWS – With Conor’s strong return to action fresh on our mind, we decided to try a Great Lakes Sprint Series race for him in between MSOKC Race No. 1 and No. 2. There were three locals in Conor’s class and about eight others from around the Mid-West and beyond, including four really fast guys who consistently finish at the top in the national events. These four ran out front all day, so the best we could hope for was best-of-the rest honors. Conor qualified sixth and finished fifth in the heat race. Conor and two others were battling for fifth in the feature until Conor's clutch broke, which put him out. It was a good experience for Conor, but we’d have some work to do to compete at the front at that level. Preparations for MSOKC Race No. 2 included clutch repair for Conor, new brake pads for Henry, and switching tires around. PRACTICE – Teenage boys can be difficult to get out of bed at 6:45 AM on Sunday, even on a race day. We got started a bit later than usual, which didn’t give us much contingency time in the event of a problem. And, of course, we had a problem in practice. An exhaust silencer bracket on Henry’s kart broke during his first session. We scrambled to fix this while continuing to get the other boys out for their practices, but were able to manage in the end without missing a session. BRIGGS JUNIOR – Turnout for Peter’s class was again an issue on Sunday, but at least he wasn’t alone this time. A former club member who does mostly regional and national event joined us for Race No. 2. This ended up to be a valuable thing for Peter, who improved his lap times significantly with someone to chase down. Peter’s class was again combined with the class that he ran last year, which also had twice as many competitors (two karts). Peter got the jump at the start of his first heat and led by a small margin for the first lap. He conceded the lead about mid-way through Lap 2, after which he went to school on the faster kart. He fell into line at the start of his second heat and the feature and followed the faster kart to the finish. Early in the feature, he was actually applying pressure at several places around the track. His best lap time two weeks ago during Race No. 1 was 51.301 seconds. During race No. 2, his best lap time went from 50.124, to 49.953, to 49.739 seconds. At the end of the day, the other kart was disqualified for non-spec tires. We’re hoping for an even better turnout in this class for Race No. 3. YAMAHA JR. SUPERCAN – Conor’s class was well-attended again on Sunday – nine karts. He drew heat race starting positions towards the rear for the first and at the front for the second. In the first, he didn’t anticipate the green flag and dropped a position at the start (from sixth to seventh). He made up two positions early and another towards the end. He had just enough time left to catch the group in front of him, recording the fastest lap time in the process (45.793), but no time to do anything about it and finished fourth. At the start of his second heat, Conor tucked into second from outside the front row. He managed to get a good run through Turn 10 on the first lap and moved into the lead going into Turn 1. He motored off and again set the fastest lap time in the process. A fourth and a first were good enough for a front row starting position for the feature. This time, he timed the start perfectly and took the lead gong into Turn 1. The pole sitter applied pressure for the first lap and a half or so, and then began to drop back. By mid distance, Conor had a two second lead. Conor’s best lap was a 45.789 on Lap 6, which was easily the fastest lap of the feature. From there, he cruised to his second feature race win in a row. The margin of victory was 4.770 seconds. 80cc SHIFTER – Henry’s class had a bumper crop on Sunday – 12 karts. He started both of his heat races from the middle of the pack. He would like to forget both of his standing starts, however. In the first heat, he bogged the engine down with a heavy hand on the clutch and lost several positions while getting away. He made up one on each of the first two laps and another after a good battle towards the end to finish fifth. The start of his second heat was almost a carbon copy of the first. This time he was mired in the back of the pack and had trouble making his way forward. He eventually finished ninth, which combined with is first heat finish, resulted in a lowly seventh place starting position for the feature. “Just stay out of trouble and have fun” was the instruction I gave Henry for his feature. He got away well this time to maintain his position at the start. He inherited two positions on Lap 4 when two karts in front of him tangled. He inherited another spot when another kart pulled off with engine trouble on Lap 7. He had been pressuring the two karts in front of him for several laps. On Lap 8, the kart immediately in front of Henry got sideways going through Turn 1 which allowed Henry to pull along side. As the other kart was straitening up, they touched slightly (side to side) and the other kart went straight into the grass in Turn 2. He proceeded through the grass directly to Turn 4 where he re-entered the track ahead of both Henry and the other kart in this battle. The short-cutter let the other kart pass but stayed in front of Henry. They ran this way to the finish, with Henry in fourth and pointing to the kart in front of him each time they passed the head flagman. The race director initially ruled in favor of the other kart because Henry had not clearly completed the pass before the incident, and in his opinion, the other kart did not gain a position (i.e., first, second, third, etc.) on Henry. The race director changed his mind when we got the rule book out and read it. The rule pertaining to re-entering the track does not refer to 'gaining a position', it refers to 'gaining time or distance on the track', which the other kart clearly did on Henry. The other kart was put back one place in the finishing order (behind Henry). This became a moot point, however, when two of the karts that were ahead of Henry on the track were disqualified in post-race tech inspection for non-spec fuel, which promoted Henry to second. NEXT RACE – So Conor is now two for two, proving that his Race No. 1 result was no fluke, and Henry has a pair of seconds to show for his efforts. We also managed to get Peter up to speed in Race No. 2. Our next race is on Memorial Day weekend, but it is on a Saturday (May 24, 2008) instead of Sunday to avoid the middle of the holiday weekend. I am pleased to announce that Loctite®, the world leader in the development and manufacture of high-performance adhesives, sealants, and chemical products, is now an official associate sponsor of Bruce Brothers Racing. Loctite® is best known in the motorsports industry for their line of thread-locking products, which are used to secure threaded connections. Henry met the local representative of the Henkel Corporation (manufacturer of the Loctite® family of products) at the candy store several weeks ago and brokered the deal himself. We have since received a package containing a wide variety of Loctite® products, which we are finding extremely useful. These include thread-locker, adhesives, lubricants, sealer, and hand wipes. 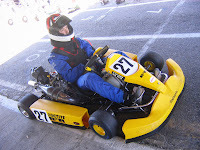 In some of the recently-posted pictures, you may have noticed Loctite® logos prominently displayed on our karts. Knowing how useful these products are, we are proud to be "spokespeople" for the Loctite® brand.